I am looking for testimony from someone who has been able to reverse the signs of aging like wrinkles and gray hair by doing inversions religiously. How long do you invert at one session? How long have you been inverting? Bringing more oxygen rich blood to the face and the scalp is the only way I can forsee aging can be reversed. 1. The act of inverting. 2. The state of being inverted. 1. to turn upside down. 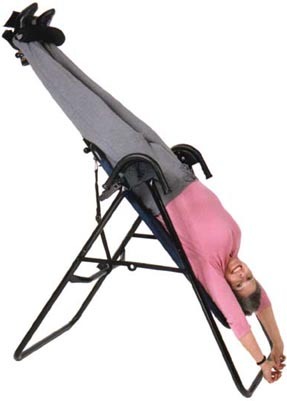 I used to do yogic headstands but my Chiropractor advised against it, saying that it's bad for the neck. I wonder if I should get back to doing it?